Climbing to the top of Sugarloaf Loop Trail in Sedona, Ariz., for a round of Uno easily ranks as one of the strangest things we’ve done as a family. Then again, there’s almost nothing I wouldn’t do to keep the kids from getting bored on vacation. You too? Even when you’re away — or maybe especially when you’re away — you have to work a little harder to ensure you and your family remain engaged. It’s way too easy to slip into a sad routine of watching YouTube, playing video games, or just vegging out. Being bored on vacation is the worst. Consider cell phone usage on vacation. A recent survey by BankMyCell found that 93 percent of travelers admit to bringing their phone on vacation. Of those, 55 percent check their phone one to five times hourly. Nearly half of tourists returning regret overusing their smartphone on vacation. 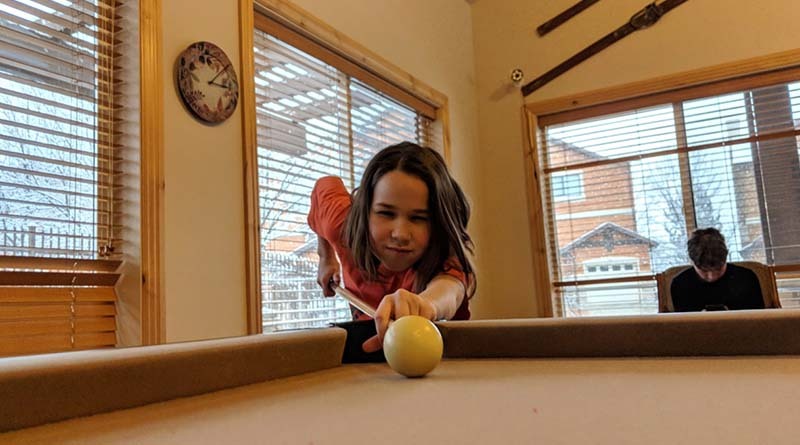 Erysse Elliott plays pool at our rental in Ogden, Utah. I know this is going to sound obvious, but there’s no excuse for getting bored on vacation. If you look around, you’ll find plenty to keep yourself occupied, even when you’re not doing the thing you came here to do. Most vacation rentals have a closet with games like Monopoly, Uno or just a deck of playing cards. It’s the first thing we look for when we check into a rental. And I think that’s great. Board games are an opportunity to spend quality time together as a family, even when one member wins every game. So the next time you’re on vacation, check the closets. If you don’t find a deck of playing cards, go to the front desk and ask them if they have cards or other games. Playing a game of Go Fish is infinitely better than watching television. I promise your kids won’t find it boring. They may be mad at each other for trying to cheat, but bored? Nah. Iden Elliott at Boomshaka Olympia, an indoor playground in Olympia, Wash. If you want to take your indoor games to the next level, you can do that too. If you happen to find yourself in a place that’s not exactly known for great weather, head over to one of the many indoor game centers for a diversion. On our visit to Olympia, Wash., for example, we found an indoor playground with swings, ladders, pools filled with styrofoam — and plenty of opportunities to blow off steam. Check local magazines or online directories for a listing of gyms and playgrounds (for example, here’s a good one for Southern California). My kids and I have visited indoor playgrounds in several states. They’re ideal diversions for rainy or snowy days. But some of these places veer to the extreme. 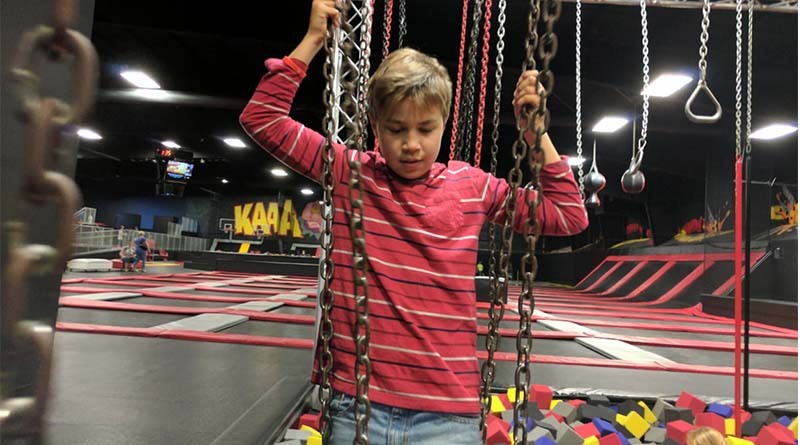 I’m talking about skate parks, trampoline parks, and bounce houses that give you, the parent, nightmares about rushing one of your little ones to the hospital with a broken neck. The other downside to indoor playgrounds is that they’re not always parent-friendly, or at least dad-friendly. The moms flock in small groups, talking about their kids or whatnot, while the dads stumble around with a dazed look in their eyes, occasionally checking to make sure junior hasn’t fallen off a rope. I am one of those dads. Some indoor attractions think the way to make us happy is by serving us beer (I’m lookin’ at you, Chuck E. Cheese). But that does almost nothing to improve our disposition. Erysse Elliott with an interactive display at the Oregon Historical Society in Portland, Ore. Bounce houses will only take you so far when your kids say they’re bored on vacation. When the whitewater rafting or zip lining falls through, it’s time to find a museum. Not just any museum — I’m forbidden from ever setting foot in a children’s museum again — but one that doesn’t talk down to the younger visitors and holds them to a higher standard of learning. One such place was an exhibit called “High Hopes: The Journey of John F. Kennedy” at the Oregon Historical Society in Portland. It had rare JFK memorabilia but also challenged younger guests with interactive exhibits (it’s OK to call them video games) that elevated their knowledge of geopolitics in the 1960s. In one simulation, for example, my son Iden had to make an important decision about deploying nuclear weapons. And what 13-year-old wouldn’t want to have his finger on that trigger? 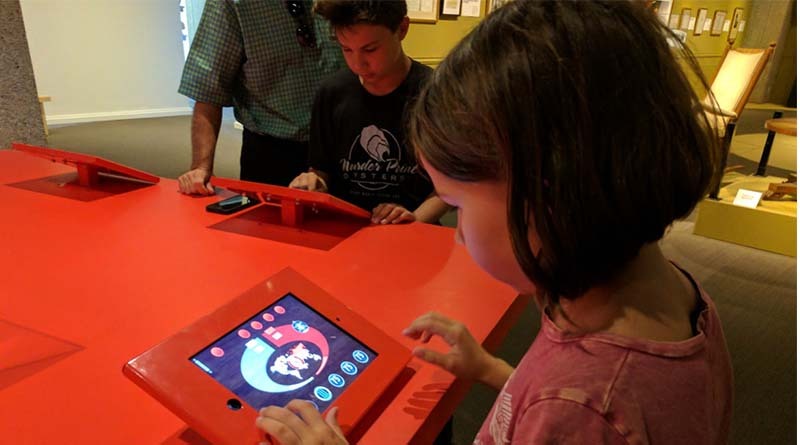 We’ve traveled to many other places that offer thoughtful, interactive displays that engage kids as much as — or more than — adults. The Denver Museum of Nature & Science is another place that does this well. Check out the Expedition Health exhibit or the VR Arcade if you think this is just another repository of dusty dioramas.